SUPPLY DEPLETED UNTIL NEXT HARVEST – BUT BE SURE TO SEE OUR SHOP (choose from over 45+ Types of P. Somniferum Poppy Seeds)!! Produces Beautiful PURE WHITE flowers, with OBLONG PODS. Grows to about 3 ft. to over 6 ft. tall. THE SEEDS YOU WILL RECEIVE WERE HARVESTED FROM THE SAME PLANTS SHOWN IN OUR PHOTOS & VIDEOS! This ‘White-Seeded” Re-produced Japanese Variety has PURE WHITE Colored Petals and OBLONG Pods (and DO NOT HAVE VIOLOT BLOTCHES IN CENTER. They Grow to about 3 ft. to over SIX FEET tall. The yield and quality is very nice. and have NOT been cross-pollinated. 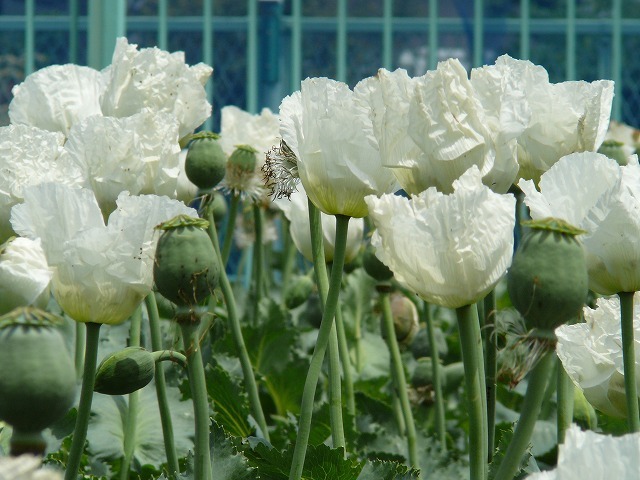 THESE are NOT “China White” (which grow much shorter, with ROUND Pods) Not to mention, China White Poppies aren’t even an “Official” Scientific Variety (meaning, there’s NO recorded Documentation by the scientific Community recognizing them). FEEL FREE to DO YOUR own RESEARCH!! I’m sure you’re wondering how or why I would have access to the Most RARE of all Poppy Seed, so allow me to first explain:. The below statement can ALL be 100% FACT/BACK-CHECKED (please request proof via PM to respect Privacy). Long story short, my “Step-Father” is a retired Clinician (however, still has Valid licenses to practice) and is still very Active Abroad (Volunteering on Board Committees, etc.). His career began in Chicago back in the days when the Mafia (Mob?) pretty much ran it all. I’m not saying he had any involvement with them whatsoever. I suppose if he told me, he’d have to kill me heh? *LOL* I WILL add that he is Italian. So go figure. But eventually, he was working with Several Major Drug Companies (Abbot was one of them, I forgot the others). But he basically worked w/ them ALL. That’s part of the job Description (I guess). From my understanding, a ‘Clinician’ acts as a Liaison between Doctors and Pharmaceutical Companies. I’m still trying to wrap my head around it. So he is the person who actually Obtained, Tested, Recorded, and Retained everything. For more info, please Contact me in Private. Long Story; Short- In the end, I began with just THREE (3) Seeds to work with. That Produced TWO 6′-7′ Plants in 2016. Which I have Continued to grow each Season since, but supply is still scarce. WE HAVE PROVIDED SOME RESEARCH LINKS FOR YOU IN THIS LISTING. PLEASE BE SURE TO WASH SEEDS PRIOR TO CONSUMPTION, AS THEIR MAY BE SIGNIFICANT TRACES OF PLANT MATERIAL (pieces of dried seed pod), SINCE MANY OF THESE SEEDS WERE HARVESTED FROM MULTIPLE STEMS, SOME of the NATURAL “Vent Holes” were NOT OPEN all the way. Which prevented the SEED TO POUR OUT NATURALLY, THEREFORE, WE HAD TO BREAK OPEN SOME PODS IN ORDER TO ACCESS THEIR SEED. 100 Seeds, 10lbs., 1lb. (16 Ounces), 1oz, 25lbs., 300 Seeds, 4 Ounces (1/4lb. ), 500 Seeds, 50lbs., 5lbs. My little secret – Shhhh! I must admit, at first, I was skeptical. But I have come to believe, after extensive research (and after my first harvest from these seeds), that these are what they claim them to be. I am a Botanist, with a Doctrine in Bio-Genetics and have exercised every resource at my Universities to come to my conclusion. My only concern was the Low Germination Rate (about 25%), which may have resulted from our x-Ray machines, but cannot be sure. Thank you Organical Botanicals for offering up such quality of service and product. isnt this just afghan poppies? LOL – Papaver Somniferum Poppies Originated in Asia. Depends on how fr back in time you wanna go. But if you’re asking what I think ur asking, (which is basically the equivalent to: “Don’t all Humans evolve from Apes?”, in which case, then sure. All 45+ of our Somniferum Poppy Seed Choices are in fact, “Afghan”.